The Corporate Identity of Solar Innova is the vehicle that projects his company attributes and values​​, a true reflection of your personality and an invaluable tool that identifies itself to its audiences. The image is formed by Solar Innova full of ideas that the public relates to it. These ideas are generated, on the one hand, based on factors such as the quality of its products and services, customer service, treatment of its staff, the seriousness and other financial aspects. The image of our business is generated by visuals as the mark (imagotype), color, typography, layout and own forms , which together represent your corporate identity. The Corporate Image Manual Solar Innova all elements of your imaging, evoking, in an orderly manner, originality and consistency, always emphasizing simplicity and understanding are shaped: the symbol, the logo, the basic colors, typography and design of all communication media even pretend to be royalty and synthesis of the qualities that best define how you act and manifest Solar Innova. 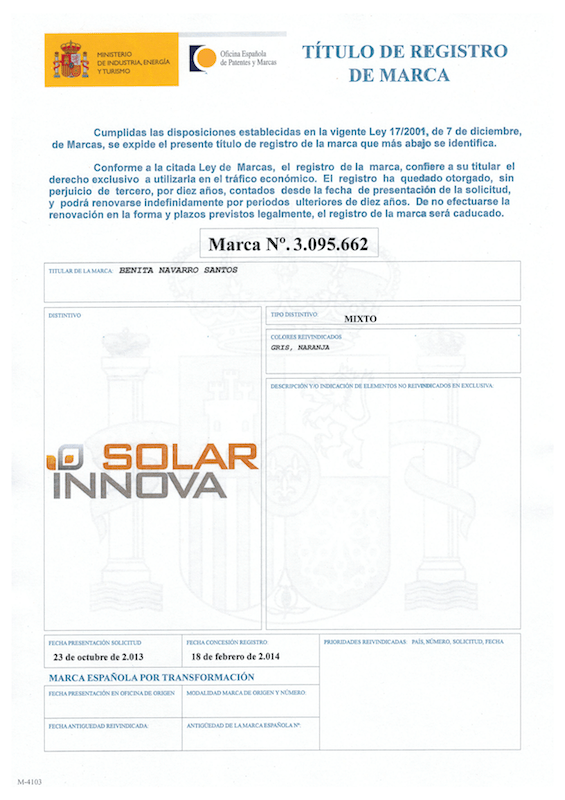 SolarInnova is a mark duly registered in the Registry of the Ministry of Industry, Energy and Tourism, Spanish Patent and Trademark Office under number 3095662. Trademarks protect the image, name and logos used for commercial purposes. The goal is to identify and distinguish the source of a particular product. Trademarks are used in the vast majority of occasions by companies but also can be used by anyone. The use of colors and very similar words as a product brand to another hard trying to look inside trademark protection as a consumer can be confused and think you are buying a product from another manufacturer. But registering a trademark does not prohibit another company to manufacture the same product or offer the same service, always under a different brand. The registration of a trademark registration is necessary to establish the ownership of it and who uses it to its owner may oppose the granting of incompatible brands with the same condition to others. 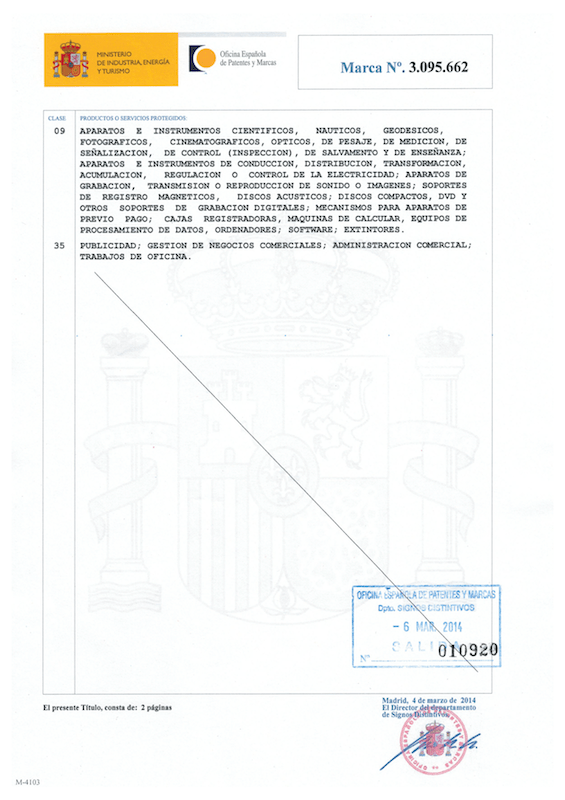 The brands in Spain are recorded in the Registry of Industrial Property. As agreed at the Madrid Conference of 1891, revised by the 1957 Nice Agreement, all regularly trademarked in the country of origin has to be accepted for registration by the International Bureau at Berne and protected by the other signatory countries remember. A trademark registered in the Public Registry legally protects its owner so that it has the exclusive right to market their products or services in the country under the trademark.